A group of British boys land on an island together when their plane crash lands. Two of the boys, Ralph and Piggy, gather everyone together by blowing a conch. The boys decide that Ralph will be their chief while they are on the island. They also decide that a fire should always be maintained on the mountain to ensure that passing ships will spot and rescue them. One boy, Jack, sees pigs on the island, and is determined to kill them for food. While Jack is hunting pigs, a ship passes by. Ralph is furious at Jack because it was his turn to manage the fire. Shortly after, a man on a parachute tries to land on the island to rescue the boys, but he dies. The boys are scared because they think there is a beast on the island. They see the carcass in the night and think it is the beast. Jack loathes Ralph because he ignores the “beast” issue and refuses to let Jack hunt. So, Jack leaves and establishes a “tribe.” Many of the boys join Jack’s tribe, opposing Ralph’s group. Jack steals Piggy’s glasses from Ralph one night to start a cooking fire. Ralph’s group is enraged, so Ralph confronts Jack’s tribe. Jack’s tribe kills Piggy, kidnaps two of the boys in Ralph’s group, and attacks Ralph. Ralph hides in the trees, injured. When the tribe sees him the next day, they chase and try to kill him. I found this book very interesting. It showed me how children, knowing little about the world, would behave and act in dire situations. This story particularly fascinated me because it revealed how an organized, disciplined society could quickly become chaotic because of fear, arrogance, and anger. The author used descriptive language which allowed me to picture a map of the island and the actions of the characters. I also thought that the book was unique because it let me know the feelings of the main characters. Although I was captivated by the overall story, many portions of the book included descriptions that I felt were irrelevant to the story. Because of this, some of the book bored me. I would recommend this book to young high school students because the book contains intense scenarios and vocabulary that may be hard to understand. I would rate this book seven out of ten stars. 1. How did the group of boys end up on the island? 1a. Their plane had crash-landed there. 2. How do Ralph and Piggy call the rest of the boys on the island? 2a. They find a conch and blow on it. 3. How did Ralph, Simon, and Jack make sure that they were on an island that was uninhabited? 3a. They climb a mountain and see that they are on an island that is surrounded by water with no signs of civilization. 4. What did the boys use to set the fire on the mountain? 4a. They use Piggy’s glasses. 5. What does Ralph see on the ocean that is producing smoke? 5a. He sees a ship. 6. Why was Ralph so mad when he saw that Jack had caught a pig? 6a. He was supposed to be maintaining the fire instead of hunting pigs. 7. What causes fear among the little children and argument among Ralph, Piggy, and Jack? 7a. The thought of there being a “beast” on the island. 8. What happened to Sam and Eric when they are maintaining the fire on the mountain? 8a. They see “the beast,” become scared, and flee to the shelters. 9. Why did Ralph, Jack, and Roger climb the mountain and what happened there? 9a. They wanted to see if there really was a beast. On the mountain, they saw it for themselves. 10. Why did Jack become so frustrated and leave everybody else? 10a. He was mad that everybody, with the exception of himself, was fine with Ralph being chief. 11. 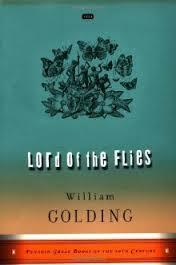 What is the Lord of the Flies and how did it get its name? 11a. It is the head of a pig that was stuck on a sharpened stick. It got its name because of the many flies that swarmed around the head and made it look like a black ball. 12. What happens to Simon when he crawls into the dance and tries to tell the boys about the beast? 12a. The boys become afraid because they think Simon is the beast. Because of this, they kill him. 13. What happens to Ralph, Piggy, Sam, and Eric when they are sleeping in the shelter? 13a. Some of the members of Jack’s tribe attack them and steal Piggy’s glasses to light a fire. 14. What happens to Ralph, Piggy, Sam, and Eric when they confront Jack’s tribe for stealing Piggy’s glasses? 14a. Piggy is killed by a boulder, Ralph is attacked and wounded by a spear, and Sam and Eric are taken hostage by the tribe. 15. Who does Ralph see when he is running away from the tribe, and why is that person there? 15a. Ralph sees a British naval officer who is there to rescue everybody.